Orphanage is an optional location in Bloodborne. The Orphanage is a hidden location with 2 optional Great One Bosses. You need to acquire the Orphanage Key (Brainsucker drop) and Upper Cathedral Key (found in Yahar'gul, Unseen Village). From the Healing Church climb the ladder, open the locked door with the Upper Cathedral Key to access Upper Cathedral Ward. Go across the large bridge and climb the long ladder inside the next building, on the balcony you will find the Brainsucker which drops the Orphanage Key. Go down the dual stairs and open the large door, entering the Celestial Emissary boss room. You can find Ebrietas, Daughter of the Cosmos, shortly after. Entering through the large door on the ground floor of Upper Cathedral Ward , you will need the Orphanage Key dropped from a Brainsucker on the top floor, turn left and go up the staircase and cross the bridge. There should be a Celestial Mob standing on the bridge. At the end of the bridge you will enter a large room where the first of two boss fights, will take place. Once the they have been defeated there will be a lamp to activate. 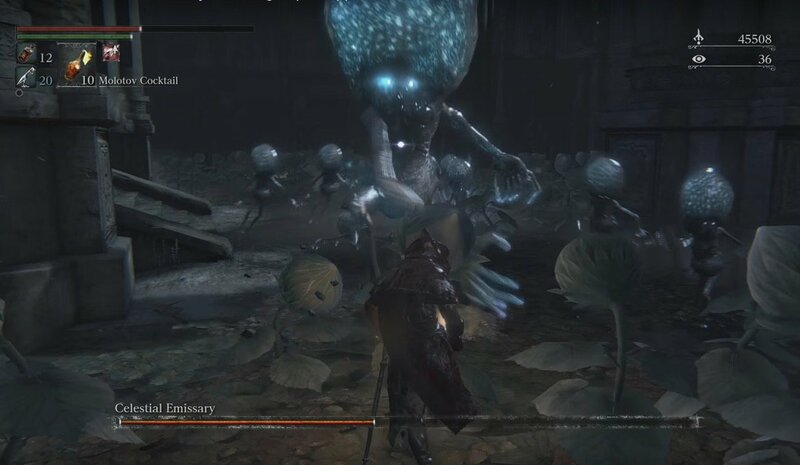 It is a good idea to return to Hunters Dream at this point and stock up as the next boss fight is in the next room. Once you have returned for stocking up turn round from where you spawn at the lamp and jump at the wall/window. You will crash through an onto a balcony with a Celestial Larvae under your feet. Run round the balcony on the right side to the outside end from where you entered, halfway along you will find A Call Beyond. A Celestial Mob will come through the archway and another of the laser firing variety will be hiding on the left as you go through the archway, he will also be drawn out when the first is killed. Once both are down take the elevator to the floor below. You'll find a group of Celestial Larvae at the bottom which you can just run past to avoid the Frenzy damage. The imminent boss fight is a tough fight, a lot more so than Celestial Emissary so don't be afraid to return to this fight later. 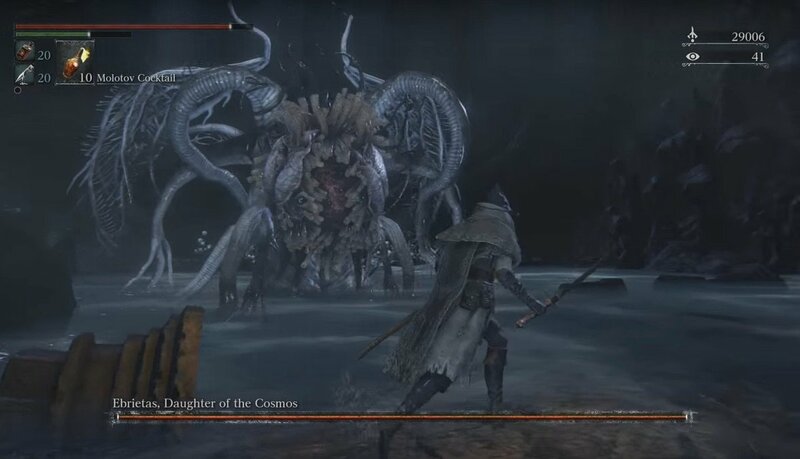 Whats with the dead thing in the back of the room in wich you fight the daugther of cosmos? Can I do something with it? Just lost 5 insight to the brainsuckers trying to find the Orphanage with this lousy description. I still have no idea where it is.